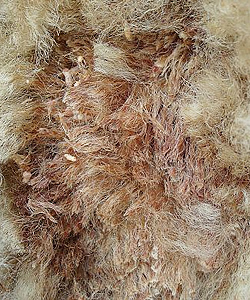 A very unpleasant problem you may encounter in your flock is that of FLY STRIKE. This is where the bluebottle fly lays eggs in the fleece and, within days, the eggs hatch into rapidly growing maggots which then proceed to eat the sheep. 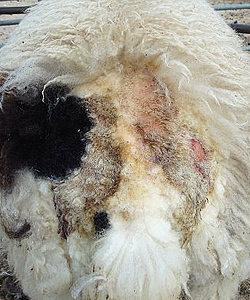 If neglected, this can lead to a very painful and prolonged death with the sheep usually dying of shock. 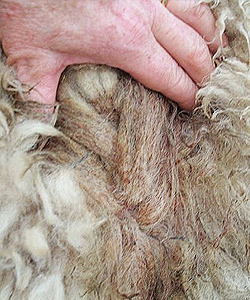 It is not just a problem with neglected sheep that have dirty back-ends. 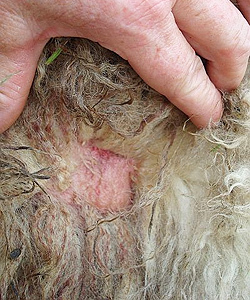 Fly strike can occur anywhere on the sheep and in the best kept flocks, but it is IMPERATIVE to observe your flock closely, especially in warm and humid weather conditions. First signs are either sheep that stamp or bite themselves or scratch on the fences. Look closely for any wet-looking patches, usually on the rump but can be on the shoulder or sides of the animals. 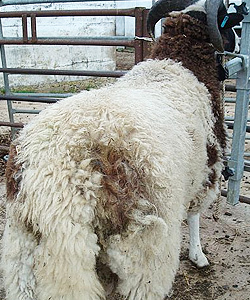 This can be a problem in Jacob Sheep as you expect to see black patches in their wool – the first photo shows a ram lamb with a black spot on one side of the tail and a Wet patch on the other. From a distance, this could be thought to be coloured wool on both sides. 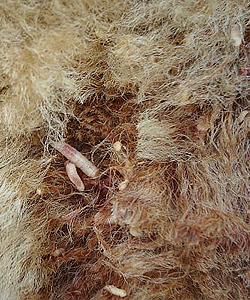 After trimming all the wool off the affected area, the maggots were killed with a commercial chemical that both kills the maggots and prevent further eggs hatching. A selection of propriety sprays are available to protect sheep for several weeks with one application. All my sheep are treated against fly strike each year but, occasionally, one slips through as you see in the photos.